RadCalendar allows you to define a collection of dynamic templates that customize the presentation of calendar days on a "per day" basis. The templates can contain regular HTML and are particularly useful if you want to implement a scheduler-like interface with extra information, such as images illustrating events, links to additional sources, etc. Define the Dynamic Template types. 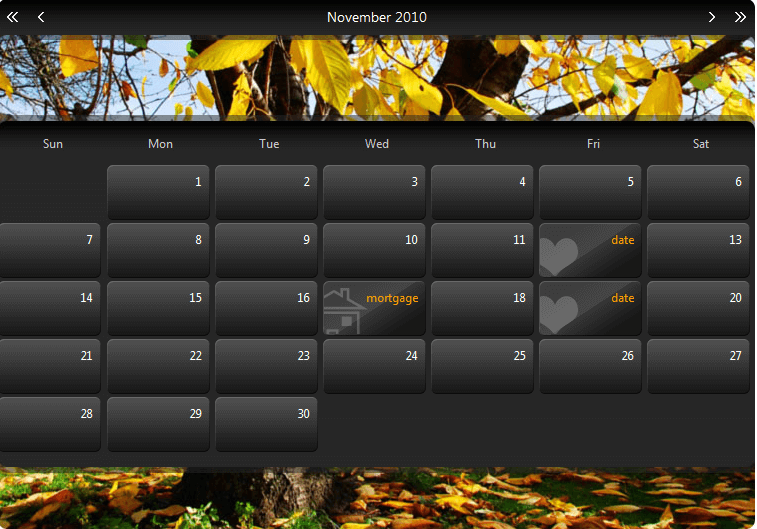 Click the ellipsis button next to the CalendarDayTemplates property in the properties pane. This brings up the DayTemplate Collection Editor. <telerik:RadCalendar RenderMode="Lightweight" ID="RadCalendar1" runat="server" AutoPostBack="true" Skin="Special"
For each template type, bring up the RadCalendar context menu, select Edit Template, and choose the template type. This brings up the Template Design Surface for the template. Add Special Days to the calendar and assign the templates. Note that the best approach for adding days to the SpecialDays collection is on Page_Load event. Also if the special days should persist not only in the current view but in other month views the AutoPostBack property of the RadCalendar should be set to true . You can add special days to a calendar without using templates. You can use their ItemStyle property to make them visually distinct.